The index opened weak and stayed weak for the entire session of trade with a dip below 7800 but closed just above at 7814.90, huge loss of 85.50 points. The broader market was weak with 564 advances to 992 declines. Range for the series is at 7600-8000. Call option 7800-8400 added huge 44.65 lacs OI with small short covering at 7600 and below strike prices. 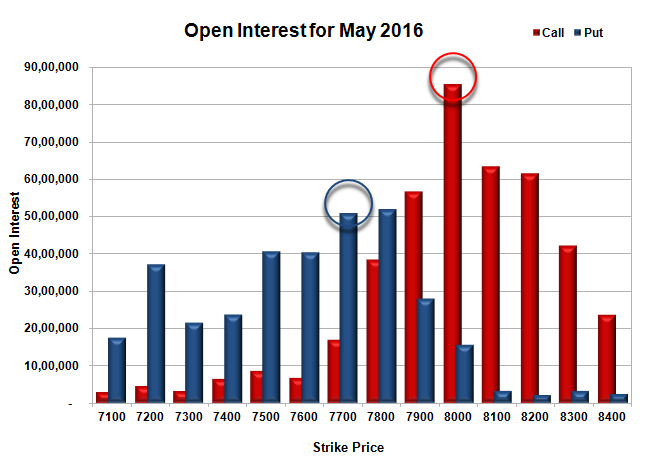 Put option 7100 added 3.10 lacs OI with huge short covering at 7800 and above strike prices. Nifty Open Interest is at 1,62,86,400 down by 7,57,575, with decrease in price, probably huge long liquidation. 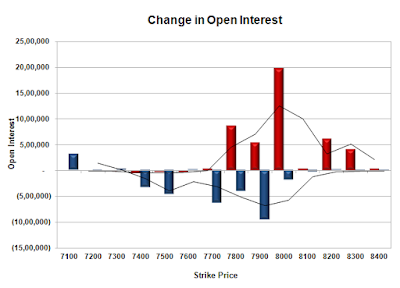 Bank Nifty Open Interest is at 17,14,470 down by 61,770, with decrease in price, probably long liquidation. FII’s sold 4052 contracts of Index Futures, which includes net 6593 contracts long liquidation and 2541 contracts short covering, with decrease in net OI by 9134 contracts, includes 31340 longs to 35392 shorts for the day. FII’s Index future open contract as on date is 134711 Longs to 95948 Shorts, Net 38763 down by 4052 contracts. 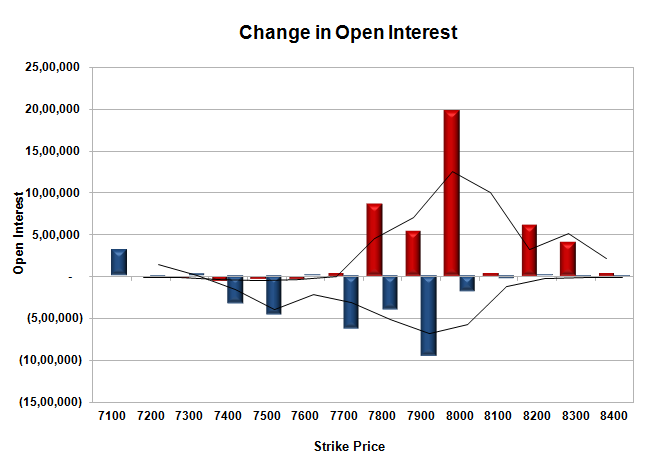 Initial support at 7800, with OI of 51.89 lacs and below that at 7700 with OI of 50.85 lacs. Initial resistance at 7900, with OI of 56.80 lacs and above that at 8000 with highest OI of 85.52 lacs. 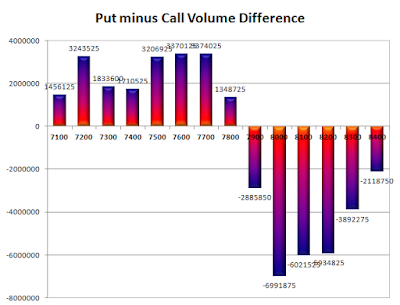 Day Range as per Option Table is 7755 - 7892 and as per VIX is 7745 - 7884 with 7827 as the Pivot.